The formal name of Kashmir Shaivism is Trika Śāstra or Trika Śāsana. Manifestation of multiplicity is necessary within the highest reality to prevent the preservation of a limited paradigm of existence, Śiva is Maheśvara and Samvit. Kashmir Shaivism was developed through the intuitive faculty of the devotees who meditated upon the Samvit Śakti  while following the paths of Prakāśa  and Vimarśa  . Trika Śasana was expanded through three main spiritual disciplines: āgama  , spanda  and pratyabhijñā  . 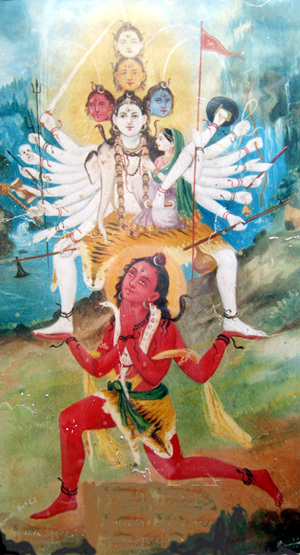 Literature on Trika Śasana was amassed for years until many Varttikā  and Vivṛti  began to be written by devotees in order to simplify the numerous accounts on the mystery of Śiva  , who is transcendent in nature but can be realized through the intuitive revelations of the these three spiritual disciplines. The following introduction will describe āgama, spanda and pratyabhijñā, the three forms of intuitive revelation, in further detail with mindfulness on prakāśa, vimarśa and samvit. Āgama literally means what has descended and been revealed to the devout Shaiva. It is the sacred śabda  which is in the form of dialogue between mahadeva, who is Śiva and mahadevī, who is Śakti. This is the processing of revelation and the process of spiritual discipline. The main āgamas are svacchanda bhairava ṭaṁtra, rudrayāmala taṁtra, malini vijayo ittara taṁtra, vijyaña tāṁtra, netra taṁtra, svayaṁbhuva taṁtra, and Śiva sūtra  . Revelations have been given to mankind by Śiva himself. The first recipient of these revelations was Durvāsā Ṛṣi who then passed it down to Tryambakāditya. It is said that Tryambakāditya was the mind born son of Durvāsā. The Tradition says that Tryambakāditya continued these āgamic revelations through his progeny and disciples known as Sangamaditya, who then propounded this system in Kashmir. Tryambakāditya was 16th in the line of disciples and was considered the Siddhayogi, his name meaning the effulgence of the three-eyed sun. Acharya Somānanda considers himself to be in his 20th descendant in the lineage. In the lineage the great Acharya, excelled through his work śrīśivastotrāvalī  , which is the essence of the āgamas. Other scholars who have contributed to the formulation of Kashmir Shaivism include: Bhatta Kallata who wrote about Vasugupta, who lived around 825 AD. Bhatta Kallata has written commentaries known as vṛti  called spanda-sarvasva-vṛti. Rama Kantha has written the spanda-vīvṛti. 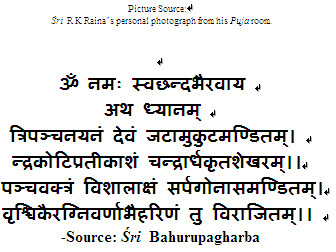 Utapalavaishnava has written the spanda-vṛtipaka. Lastly, Kshemarāja wrote the spanda sandoha and spanda nirṇaya. It is worth noting that Kshemaraja has addressed himself as the pādapādamajīvan  of Acharya Utpaladeva. All the works authored by Mahāmāheśrarācārya, the excellent teacher, adored as Rajanaka, Śrimat, Utapaladeva, are considered by him to blessed as they have all sprung from the realm of the lotus feet of his guru pādapādamajīvan. Pratya  bhijñā  literally means the reflections of one’s intent. Pratyabhijñā primarily means the doctrine of Self-recognition. This tradition is philosophic in concept and content. It is also monistic in character and follows philosophic terminology to establish oneness with Śiva. It was Acharya Somānanda who wrote Śivadṛsṭi to establish the system. This system deals with the concept of the self  , which is the source of all creation and manifestation, as that which is to be recognized through the doctrine:“I am Śiva”. Acharya Utpaladeva has written the īśvarapratyabhijñā, which is a philosophy that is triadic in nature with reference to the 3 Upāyās, established as shāmbhava upāyā and to be approached through śākta upāyā. On the existence of, or through the perception of, āṇava upāyā. It is subdivided into these upāyās for the cleansing of the self which can be attained through initiation granted by the great masters of the Trika Tradition. The pratyabhijñā system is a path to attain Śivahood. Somānanda has contributed to this system which has been referred to in the spanda-vivṛti. Śivadṛsti is the sacred text on the Śiva-Advaita. To study the pratyabhijñā system, we have to study the Śivadṛsti in order to import the true consciousness of Śiva. The literal meaning of Śivadṛsti is the Vision of Śiva or the Knowledge about Śiva and it is in the anuṣṭup chanda  of 8 syllables. This sacred text consists of 700 ślokas  , divided into seven āhnikas  . The first āhnika deals with obesience to Śiva as self from microcosm to macrocosm. The second āhnika deals with Śabda  Advaita which is the immutable monistic primal word which means Śiva is truth, and one. The third āhnika deals with the comparitive study of Śaktism, the dualistic Shaiva’s and Patanjali Yoga. The fourth establishing Śiva as the monistic approach to reality. The fifth deals with the “subject/object” and its synthesis. The sixth deals with the Vedānta, Pañcharatra, Sāmkya, Nyāya, Vaiśeṣika, and Buddhist principles. The Śivadṛsti deals with all these subjects as a comparitive study while establishing its own Advaita  philosophy on Śiva. The seventh āhnika deals with ānanda  -avasthā which is the blissful realm of the divine, who is Śiva. Abhinavgupta ,The great Acharya of Kashmir Shaivism is the acclaimed author of the Tantrāloka which is considered to be the Encyclopedia of Kashmir Shaivism. He was a grammarian who wrote on, and studied Dvaita and Advaita Tantra, Dualistic Shaivism, Brahmavidya, Trikadarshana, Dhvanishastra, Natyashastra,and Aesthetics from different teachers. His acclaimed treatise is Vimarshinivṛti on Iśvara Pratyabhijñā He was the disciple of Achrya Utpaladeva and he has written kramastotra, bhairava stotra, anubhavanivedana stotra, dehasthadevata stotra and mīmansa on dhvani and rasa which is the quintessence of Sanskrit literature associated with Trika philosophy. It is said that Abhinavgupta’s spiritual power was very great, and his contemporaries often saw this greatness. There was clarity in his mind about Śiva consciousness. He had a powerful memory and marvelous intellectual approach toward realization. He had a very strong command over language. Baumer, Bettina, ed. Para-trisika-Vivarana: The Secret of Tantric Mysticism. Translated by Jaideva Singh. Delhi: Motilal Banarsidass Publishers, 2005. Chatterji, Jagadish Chandra. Kashmir Shaivism. New York: SUNY Press, 1986. Maharaja, Svami Laksmana Joo, ed. The Sivastotravali of Utpaladevacarya. Translated by Ksemaraja. Delhi: Ishwar Ashram Trust, 2000. Pandey, Dr. Kanti Chandra. Abhinavgupta: An Historical and Philosophical Study. 2nd. Varanasi: Chowkhamba Sanskrit Series Office, 1963. Pandit, M. P. Gems from the Tantras (Kularnava). Madras: Ganesh & Co., 1969. Singh, Jaideva, trans. Siva Sutras. Delhi: Motilal Banarsidass, 1988.
Zimmer, Henrich. Myths and Symbols in Indian Art and Civilization. Edited by Joseph Cambell. New York: Pantheon Books, Inc, 1946. I will devote myself to constantly reciting your name. I enjoy the flavor of your name(bhava). Your name is said to be the great spiritual nectar. Mahārasa(महारस): The Great Taste. That taste from which you do not want to part with. Total absorption is due to the taste being compared to the nectar of life. When one tastes the nectar of life, nothing afterwards can be comparable, so one will strive to taste that nectar again. There really is no going back as nothing else can be considered to taste as good. This is known as svātmasvarūpa with Śiva. Mans Physical and Mental Nature totally absorbed with Shiva. In Kashmir Āgamas, the ānanda is of Seven types: The first, Nijananda is where the mind rests only on the Subject of experience. The second is Nirananda, when the mind contemplates over the absence of all objects of experience. The third, Parananda, is where there is contemplation on inhaling and exhaling. The fourth, Brahmananda, is where the mind rests on balancing the breath. Mahananda, the fifth, is where the mind rests dissolving all knowledge and objects of knowledge. The sixth, Chiddananda, is where the mind rests with all consciousness. Jagatananda, the seventh and final type is where the mind rests on all awareness surpassing all other states of spiritual delight. Sadhana(सधन): Focusing the mind on an Object to achieve perfection through its benefits. kiṁciccalattātmaka (किंचिच्चलत्तात्मक): Whatever is Animate and Inanimate is verily Shiva. The word Achala means permanent and non-transitory, ever flowing with its infinitesimal nature. vṛti(वृति): Commentary, Literally innate nature of the self, also in the Shaivistic texts it suggests its meaning, style and composition and explanations. It serves as a glossary to the texts. Paada means the feet, Padma is Lotus Jiva means the embodied soul. Logina means the eye, or perception. It means perception viewing power. The lotus is always clean, it never gets stained with Water though it is always in water. It is not attached to the worldly sins, what is not good. Hence, being born from the Dust of the Feet of the Lotus implies that he is born without this sin and that these attachments to not stick to him. Pratya: To go towards, to behold, to perceive, to Consider, to Acknowledge. Śloka (श्लोक): The word śloka has four lines or two lines, four lines with eight syllabes or two lines with sixteen syllables. It means verse. It is a form of poetry in meter, not a mantra. Āhnika(आह्निक): Flaming Chapter. The word derives from ahnā nivṛtam(अह्ना निवृतम्) which means the scheduled sacred works to be performed daily as well as explanations and annotations on special Shaivistic works. Śabda(शब्द): ÖŚabd(शब्द्) means word, articulate sound,verbal testimony and expressive. Śabda hence means Śiva because he provided the articulation of the varna(letters) for the words during the cosmic dance which became the source of the maheśvarasutra and Śivasutra. 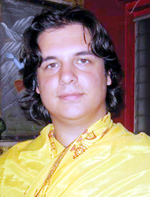 *Alexander David Conroy, has studied Sanskrit and Kashmir Shaiva Philosophy at Florida International University. He was born a Catholic, yet has more active interest in Hindu, Buddhist and Jewish philosophy and mysticism. He has a background in psychology and computer science. He also has and continues to receive western esoteric training in Kabbalistic Shamanism and is an avid martial artist. He has written many articles comparing seemingly separate mystical and esoteric traditions. Presently teaching introductory religion in-class and online courses at Florida International University, he is working on his Thesis comparing the mysticism of Adi Sankara and Moses Maimonides. Super article ....Great work Keep it up. One of the best article on Kashmir shaivism by an American Trika Shaivism Scholar.